After the fall of the Ming dynasty, the validity of the Sinocentric ‘Middle Kingdom’ world view formed an enduring point of contention among intellectuals in Japan. In the late Edo period, the proliferation of ‘Dutch studies’ together with recent contact with foreign ships brought about a renewed awareness of a ‘home territory’ in a wider international context. This led to a variety of cartographic responses, which arguably reflected an anxiety with the role of Japan in the world. On the one hand, geographically accurate world maps were published by the polymath Shiba Kokan and the Osaka-based physician Hashimoto Sokichi. On the other hand, maps based on Matteo Ricci’s 1602 Kunyu wan guo quantu continued to be reprinted with the inclusion of news-like updates, while also reproduced on a variety of media such as folding screens and ceramic dishes. The case of Nagakubo Sekisui is representative. After publishing the first map of Japan using latitude and longitude, in 1788 Sekisui also published a map of the world based on Ricci’s model. The map was nevertheless updated with information on the presence of the Dutch in Java and the establishment by the Dutch of a ‘New Holland’ in the Southern Continent corresponding to Australia. This example, among others, indicates that maps originating in Ricci’s model – usually considered ‘antiquated’ – emerged as newly relevant through their proclamation of ‘Myriad Worlds’ of which Japan was but one. Radu Leca received a PhD in History of Art from SOAS in 2015. His article ‘Brazilian Cannibals in 16th-century Europe and 17th-century Japan’, Comparative Critical Studies, 11, Supplement, discusses a transcultural iconographic transfer through the cartographic medium. This interest in cartographic sources is met by SISJAC’s extensive collection of historical maps donated by Hugh Cortazzi. Their close examination is feeding into Radu’s forthcoming monograph on the spatial imaginary of early modern Japan. The collection is also the focus of an international workshopRadu is organizing at SISJAC in June 2016. 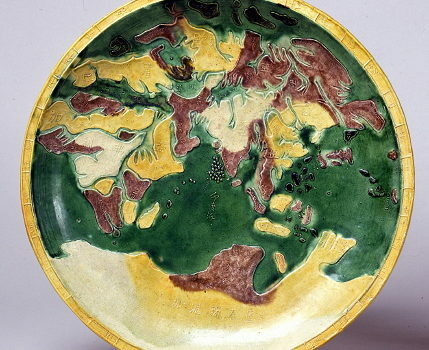 Image: Eurasia and Africa, late 18th c., Gennai ware, 37 cm diameter, Kobe City Museum.